It’s a weeknight, you have rushed home from work, you are starving and now you have to cook dinner! I get it, we are busy and the last thing you feel like doing is spending the next 2 hours making something healthy for dinner. Let me introduce to you the weeknight lifesaver. This recipe took no more than 15 minutes from start to finish, and that included the cleanup! All you need for this recipe is a chopping board, knife, baking tray and salad bowl, so even the clean up is easy! You can even cook once and eat twice, and enjoy this recipe the next day for lunch so add in a little extra ingredients and you are good to go. Fish is a natural source of essential fatty acids and fat soluble vitamins. We need those vitamins and the Omega3 for all our hormone development, adrenal health, glowing skin, moods and sleep. This Recipe is Gluten free, Dairy free (optional), Meat free, rich in fibre and phytonutrients. Into a small baking tray add the tamari, honey, ginger and mix well. Place the salmon into the tray and using a spoon coat the salmon in the liquid. Place into the oven on 170 degrees and cook. This should take around 20-30 minutes depending on the size of your salmon. While the salmon is cooking, chuck all the salad ingredients into a salad bowl and mix well. 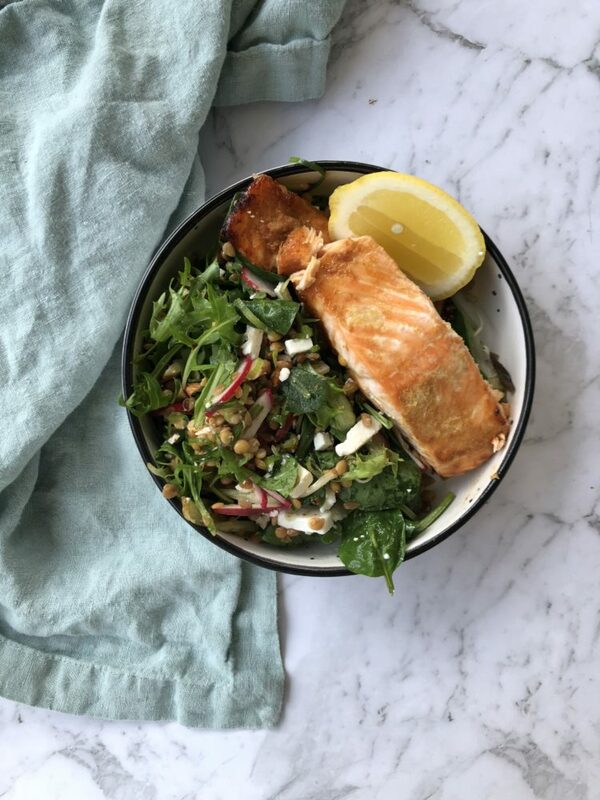 Place the salad into serving bowls and once salmon is cooked place the salmon into the bowl to enjoy. * Give your salad some crunch with pumpkin seeds, roasted buckwheat and sesame seeds.